"Discover The Ultimate Lazy 3-Step Formula For Building Your Own Profitable Mailing List On Autopilot"
There have been many innovations over the past few years that help to build lists, such as popups, fly-in ads and many others. So what exactly is a "Reverse Squeeze Page"? You may already have heard of standard Squeeze Pages (also referred to as "Email Capture Pages"). Many marketers are already using them with sales pages for their products. The Reverse Squeeze Page is a brand new variant on the Squeeze Page concept. As the name implies, a Reverse Squeeze Page, operates in reverse to a standard Squeeze Page. Visitors can immediately access your article content pages - so anyone coming from the Search Engines or other sources will gain immediate access to the content - and of course any adverts that go with it. However with a Reverse Squeeze Page, visitors are only able to view a limited number of the pages on your site (for example you might allow them to view any 3 of your pages). When they reach this limit, they are then directed to your Squeeze Page. They must fill in their name and email address before they may continue browsing the site. Joe comes to your site from a Search Engine, to read your newsletter archive (it could just as well be a site full of cookery articles, pet articles or anything else). Joe likes your site so after reading the first article, he clicks the links for a few more. Joe reads a second article and then a third, but when he clicks to read a fourth article, instead of showing Joe the article page, the software redirects him to a Squeeze Page asking him to enter his name and email address before he can continue reading the articles on the site. It also offers him a nice free gift as a further incentive to enter his details. Now at this point, Joe has already demonstrated an interest in your site and its subject matter. He clearly wants to read more - and you are offering that to him. You are also offering him a nice bonus gift - and all just for entering his details. I think you'll agree that there's a very good chance that Joe will now go ahead and enter his details. As soon as he does this, he can of course continue to read as many articles as he wants, without further distraction. Your Reverse Squeeze Page technology just added Joe to your mailing list - completely automatically and with zero input from you. If you'd like to see a demonstration of the system, just click here (it opens in a new browser window). If you view any two of the holiday article pages, upon clicking to view the second one, you will be directed to a demonstration Squeeze Page. 1. The system is not triggered by specific pages, but by a count of the total number of pages that the visitor has visited. It doesn't matter which pages a visitor visits on your site. The software simply keeps a counter and when this reaches the number you have specified, the visitor is redirected to your Squeeze Page. 2. In the demonstration holiday article site, the "page count value" is set to one, which means that you can view just one of the pages - and then upon clicking to see a second page, you are sent to the Squeeze Page. For your article sites, you can select any page count value you want - from just a single page, up to any number you want. 3. In the demonstration holiday article site, viewing the central index page does not count as a page view. For your article sites, you can choose whether to count index page views or not. (The decision will depend on the structure of your article sites). Alternatively you can just as easily use the software with sites which do not have a central index page. 4. If you wish, you can allow visitors to refuse to subscribe. This means that if a visitor doesn't want your gift, he/she can still continue reading the articles. Alternatively, you can insist that all visitors must subscribe before they can continue viewing pages on your site. This choice is entirely yours. I hope by now that you're starting to see the true power of this amazing solution, which can provide a continual stream of new subscribers for you automatically. 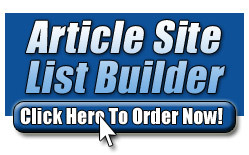 Now I'd like to show you just how easy it is to add this system to your website using our powerful Article Site List Builder software. The first part is the Squeeze Page Maker, which creates the Squeeze Page to which your visitors will be sent after they have visited the specified number of pages. The Squeeze Page contains a signup form for your autoresponder along with details of the gift you are offering. You can see a screenshot of the Squeeze Page Maker below. Simply enter a description of your gift, optionally enter the web address of a graphic for the gift and paste in a signup form from your autoresponder. The software will then instantly generate your Squeeze Page and save it onto your PC. The Squeeze Page is complete and ready to use, but if you wish, you can easily modify the page using any HTML editor, to make it look exactly how you want. The second part of the software is the Web Page Updater, which updates all your article pages with the special script needed to operate the Reverse Squeeze Page. You can see a screenshot of the Web Page Updater below. As you can see, it's very simple to use. Before you can use this software, you will need to have all your article pages in a single folder on your PC. You then select one of these web pages (any one of them) and enter the Page count value (the number of pages that visitors can view before they are to be directed to your Squeeze Page). Then you click the Update button. Every single web page file in the folder on your PC is instantly updated with the Reverse Squeeze Page technology. The software will automatically skip any files that have already been processed, so you can safely use the software repeatedly on the same files (if for example, you add more pages to the site at a later date). After using the software, you simply upload the updated pages to your web server - then sit back and let the system recruit subscribers for you automatically. Building your own mailing list just doesn't get any easier than this. To supplement our superb software, we've included three quality bonuses, all aimed at helping you to build and profit from your mailing list. Our first bonus is Proven List Building Strategies Revealed, an excellent 81 page report on how to build and manage your mailing list, written by a highly experienced marketer. Learn in detail about the five methods of list management that will ultimately determine the outcome of your business. Selecting the correct one from the very beginning is essential, otherwise, like myself in earlier years, you may find yourself swapping from one to the other, costing you tens of thousands of dollars, not to mention thousands of hours of precious time. 5 little known facts about the e-zine that you probably didn't know, that when put together, (unknown to the majority of marketers) actually make it one of the least responsive list management types available to your business. This is contrary to what many are teaching, however it is fact. I'll show you why. 2 clear cut techniques that allow the pushed for time marketer to manage a huge list of customers, ready and waiting to buy your products without the hassle of having to write and send out content every week. There's far more important (not to mention profitable) ways you could be spending your time on your business. Why simple ads for your own products draw far more of a response than running a content driven e-zine. I'll show you 3 additional reasons that subscribers will stay on your list that do not relate to written content in any way. It's a massive time saver, not to mention response booster. Why are you subscribed to other marketers lists? I'll demonstrate exactly why lists maintained in a specific way that do not actually provide huge amounts of regular useful content are often more responsive than those with full time editors. In fact, I'll make you a bet now that you're on someone's list for one of these reasons without even knowing it. Keep your list responding. The competition is fierce, and if you want to stay ahead of everyone else, you need to keep your customers responding to you. We'll discuss 15 separate methods that alleviate this problem. Remember, these are all proven methods and I'll be giving you real life examples of where these are occurring today. Dissecting the ad list. There are 3 separate methods of running a successful list that doesn't provide regular content. If you're using any of them but one, you're throwing money away right now. We need to stop that dead in its tracks. The number one rule of list management. The moment this rule is broken, even before any subscribers land on your list, the future of your business is ruined, and you may find yourself starting from scratch in several years time when the effects become obvious. What a huge waste of your time. I'll show you how to avoid this common mistake. Dissecting the personal lists. Low content lists that provide consistent through the roof response rates are easy to achieve. There's three ways of doing this however, and only one has consistently provided top results, the other two fail miserably. Learn the difference today before you pick the wrong option. Discover how you can be making 5 times your current income simply by dividing your lists up into separate categories, even if they contain the same number of subscribers as your one large list. It's not enough to build a mailing list, you need to generate profits from it afterwards - and that's what our Mailing List Profits ebook will teach you. Find out the 6 (SIX) Profit Centers you can build into your mailing system so that you can make your money with each and every way possible from your subscribers - from the moment they visit your Lead Capture Page until they read your emails. Learn what it takes to build your mailing list asset from scratch and get all the things you need to get started so that it will work hard to make money for you. A subscriber can be subscribed to an average of 8-20 newsletters. Discover how you can win your subscriber's attention over other publishers who may send a similar endorsement as yours! No, it has nothing to do with offering additional bonuses, though that is one good edge. Discover the pros and cons of each newsletter format to help you to decide which one is best for you. I am going to show you how you can learn whether your subscriber is even your prospect in the first place and find out what they need so that you know what product or service to endorse to them. I am also going to show you how can get your subscribers to cooperate with you on this for free. If you are poor at writing or just don't have the time to write and compile content for your E-zine, this will naturally appeal to you. Find out how you can still get the content you want to share with your subscribers without having to write a single word, if you wish to, and still make money. I will reveal to you some of the few ways which you might have not even thought of, which can be responsible for the healthy growth of your mailing list. With all this mailing list wisdom and knowledge packed in one book, you can now create your own responsive mailing list where your subscribers really care about what you have to say and buy what you recommend - it's like having your own personal fan club! In this in depth product you get eighteen step-by-step videos that show you exactly how to boost the number of high quality email subscribers you get every day ... for free, and starting immediately. In this video you'll discover how to structure your site that can instantly and effortlessly increase the amount of high quality opt-ins you get. Here I'll show you how to create and design a front page that will maximize your opt ins. In this video you'll discover how to tweak and optimize your pages to get the highest visitor-to-subscriber ratio possible. 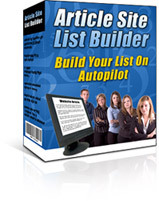 Building your own mailing list is an essential task if you want your own successful Internet business. 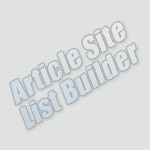 Article Site List Builder offers you a revolutionary powerful brand new solution to rapidly build your list on autopilot. With every extra subscriber representing potential extra money in your pocket, this superb software could help substantially boost your income. With all these benefits, I'm sure you'll be amazed when I tell you that you can get this software, complete with all the valuable bonuses for just $37. You'll receive instant access to your package, even if it's 2 am in the morning. Requirements: This software is for use only on PCs running Microsoft Windows. It requires an autoresponder which allows you to set the web address of the subscription thank you page (the page to which subscribers are sent after they have entered their details into the signup form). Most autoresponders provide this feature as standard. Earnings Disclaimer: Although we provide tools and resources to assist you in building your list, the resulting profits are dependent on many factors outside our control, including the quality, subject matter and content of your websites, the number of visitors to your site and the quality of the newsletter or emails that you send to your list. We are not therefore able to give any guarantees about the level of income that you will attain by using this software. We will however happily refund your money in full in the unlikely event that you are unhappy with your purchase.